Diagnostic injections can help the doctor to identify the cause of pain, therefore, making the plan of treatment more focused and more effective. Finding a specific diagnosis leads to better treatment and better outcomes for the patient. The facet joints are the small joints between the vertebral segments on both sides of the spine. Each vertebral segment has two facet joints, one on each side. These joints provide stability and control for bending and twisting. 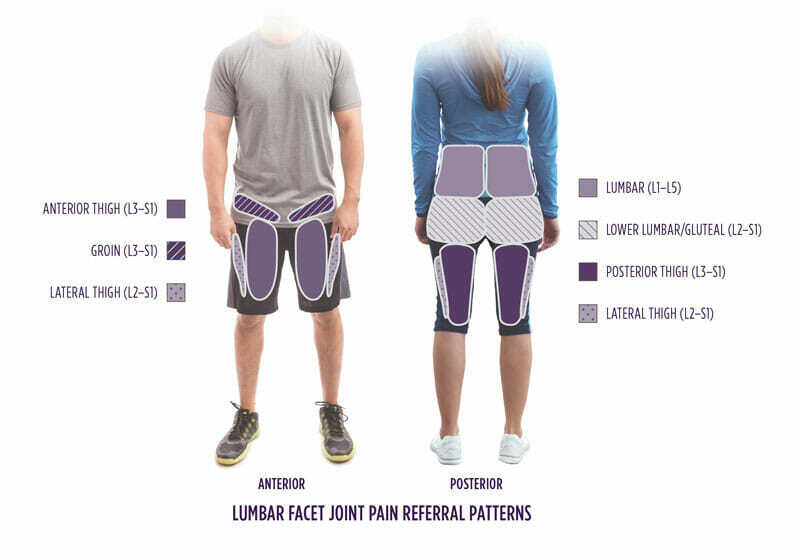 Pain in the low back with a less specific, vague aching in the legs (one or both) may be caused by injury or osteoarthritis of the facet joints. If you obtain pain relief while your medial branch nerves are anesthetized, then your doctor knows your pain is facet joint related. A local anesthetic is used to temporarily try to block these nerves from sending the pain signals on to the brain. If you have pain due to facet joint arthritis, you may feel relief of that pain for a few hours. If significant pain relief is obtained through this temporary block, then you may be a candidate for a more long-lasting block of the nerves called medial branch radiofrequency neurotomy. Medial branch blocks are often used as a test to determine if radiofrequency neurotomy may help reduce your pain. The patient is placed in the prone (lying face down) position with a pillow underneath the abdomen. The skin of the low back is sterilely prepared. Using fluoroscopic (X-ray) guidance, the bony landmarks are viewed. The skin is anesthetized. Under fluoroscopic guidance, thin needles are advanced to the appropriate area for medial branch blockade. A small volume of contrast solution is injected to prove that the medication will stay in the appropriate area. Then, a small volume of long-acting anesthetic is injected. The patient is cared for in the recovery area for 20 minutes. For a diagnostic injection, you should have some pain at the time of your procedure or be able to consistently reproduce it with certain activities. If you are typically pain-free after taking pain medication, please do not take these medications for 4 to 6 hours before the injection. There are no special dietary instructions for this procedure unless it includes sedation. While the procedure may take less than 15 minutes, you should allow for at least 1 hour at the procedure center. Inform your doctor’s secretary if you have a pacemaker. After the procedure, you should try to gently reproduce your pain and inform your care team of the percentage of relief you obtained from the injection. Allergic reaction to the anesthetic or X-ray dye. Be sure to inform us before the injection if you have any known allergies. Temporary pain at the injection site.